Quick SummaryThis total body trainer is a top choice for efficient workouts that are gentle on joints; many shoppers choose Max Trainers as alternatives to ellipticals and treadmills.Read on for our full review of the Max Trainer M7 with details abou.. This total body trainer is a top choice for efficient workouts that are gentle on joints; many shoppers choose Max Trainers as alternatives to ellipticals and treadmills. 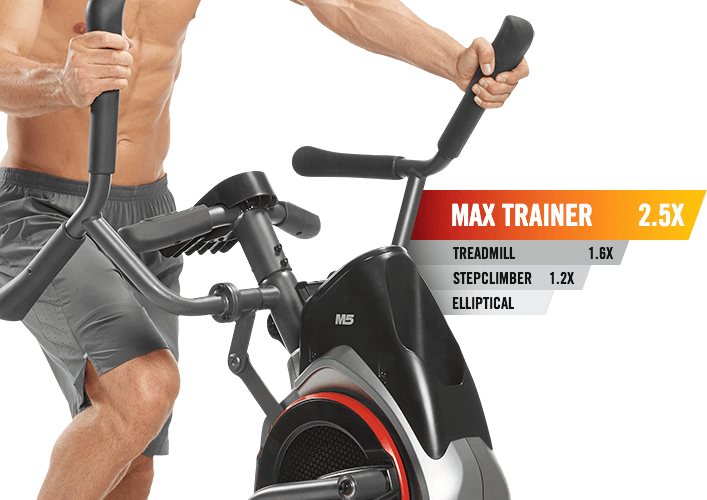 Read on for our full review of the Max Trainer M7 with details about its pros and cons. Rating: 97/100. Want total body training to be quick, painless and very effective? 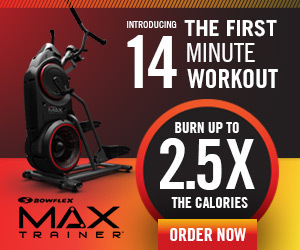 A Bowflex Max Trainer might be your best buy. 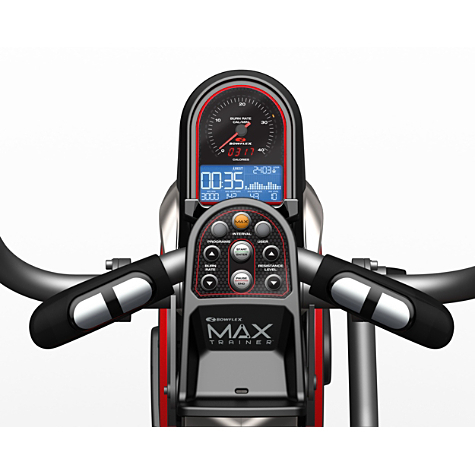 The Max Trainer M7 leads the three-model series (M7, M5 & M3) and makes the most of zero impact motion. As your arms and legs move without any jarring impact, you’ll be able to exercise with less perceived effort and get results extra quickly. How effective is the Max Trainer M7? It outperforms treadmills, ellipticals and stair steppers in terms of calorie burn. In fact, it’s so effective that a mere 7-minute workout can pay off! Most popular with this trainer though is what Bowflex calls “the ultimate 14 minute workout.” This workout is among 11 built into the machine. All Max Trainers earn positive reviews, but the M7 stands out from the others with lots of upgrades. One is wireless heart rate monitoring with a chest strap included. Another is the series’ widest selection of training programs, including several that can adapt to user profiles. Other upgrades range from stainless steel sport performance pedals to premium club-quality grips on the arm bars. The Console on the M5 is backlit and easy to read. It gives you feedback on the essentials like your workout stats, program, etc. There’s also a calorie burn rate meter and a small media shelf to hold your tablet or ipod. The console on the M7 however is a bit larger with an enhanced dual mode LCD display. It’s also a bit sleeker and less clunky button-wise than the M5 console. It carries a better media shelf above the console (that doesn’t block the console stats). And while the M5 stores data for 2 different users, the M7 console stores data for 4 different users – making it a better choice for families. 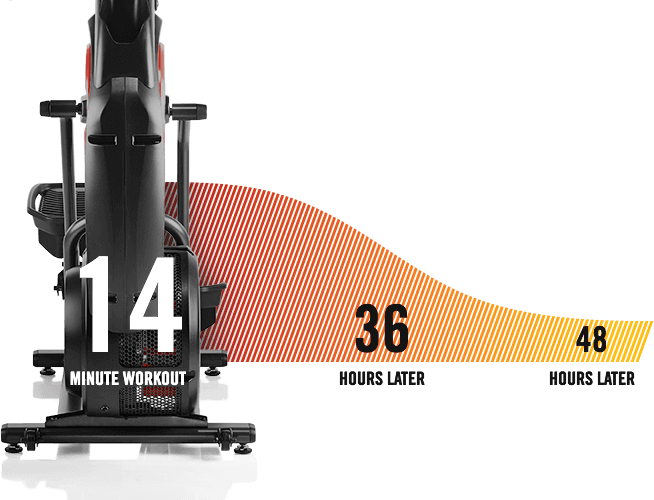 Another feature the M7 Max Trainer has that you don’t get on the M5 is the Performance targeted programming. As you workout, the M7 learns about your personal fitness level and goals. It then sets new targets for you, helping you go further and reach new goals. There are also a few design upgrades on the M7 that add to a sleeker look and more optimal use. 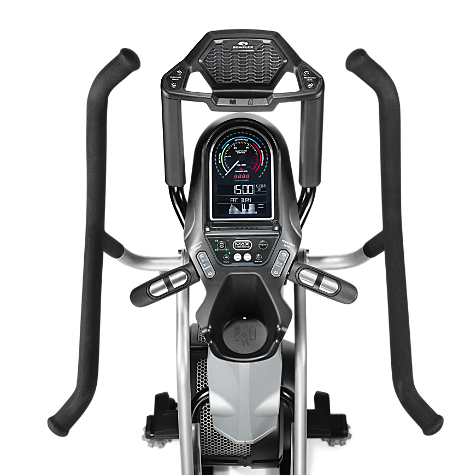 The M7 comes with enhanced “commercial” grips with new aerobar hand positions vs the ergonomic grips on the M5. Basically this means that there are more areas to place your hands on the arm bars (so you can move your arms around on the bars and train different upper body muscle groups). 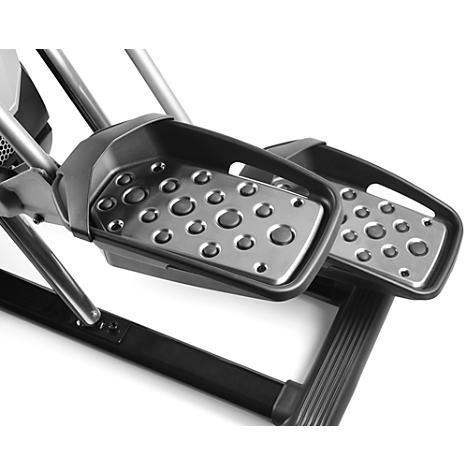 You also get upgraded “racing” pedals on the M7 that you don’t get on the M5. I haven’t quite figured out what the main advantage to these are – other than they make the machine look a bit more polished. But still, for some people, it may be important. 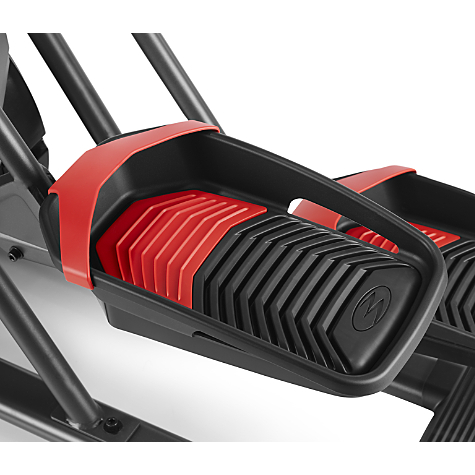 The M7 Max Trainer comes with more resistance levels and workout programs than the M5. For example, on the M7 you get 20 levels of resistance whereas you get 16 levels on the M5. This means you basically have more room to grow on the M7, as your fitness level improves. 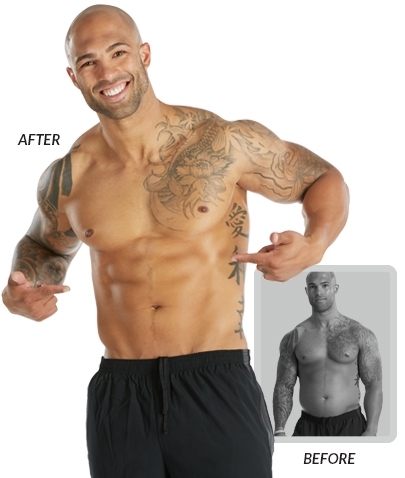 You also get a few more workout programs – especially HIIT training workout programs. So the M5 gives you the famous Max 14 Minute Interval, Power Interval, Calorie Goal, Steady Pace, Fat Burn, Calorie Burn, Stairs, Manual, and Fitness Test programs. The M7 gives you all of these and adds a 7 minute interval and 21 minute interval workout as well. There are a couple of other small differences that may – or may not – matter to you. First of all the M7 trainer gives you a bit more warranty protection that the M5: you get 3 years instead of 2 years on the M5. On the other hand, the M5 Max trainer is a bit more compact than the M7 model. The M5 measures 46.1″ L x 25″ W whereas the M7 measures 49″ L x 30.5″ W – so if your workout area is smaller, the M5 might be the better option here. One thing to note is that they both give you online tracking with the Free Bowflex fitness app – so you can track your progress over time.